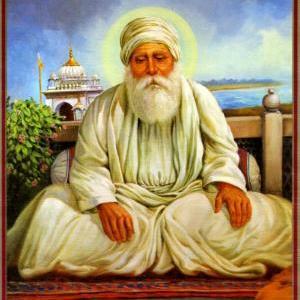 Guru Amardasji, the third Sikh Guru was preparing to appoint his successor. He secretly decided to put all his disciples through a test. The Guru asked all the disciples to get some earth and build small mud platforms. They all hurried and each one made a small platform. When the Guru came to check the mud platforms, he asked all the disciples to pull down the platforms and rebuild them, since they were not as he expected. Thus each time the mud platforms were made, the Guru rejected them for some reason or another and asked them all to rebuild the platforms. Guru Amardas was quite old at this time, so several disciples began to think that he was becoming senile and was no longer in full possession of his senses. As a result, one by one the disciples abandoned the work. Only one middle-aged man named Ramdas, was the only disciple left, who patiently and cheerfully made and re-made the platforms seventy times. The others taunted and jeered at him and told him that he was mad. Ramdas said to them “Brothers, the whole world is blind and mad. But the only one who can see and is sane is the Satguru.” Guru Amardasji embraced Ramdas and filled him with spiritual wealth. He had found his successor, a man who would serve the Lord with no thought for himself, with a heart big enough to help and comfort thousands of souls. Thus Guru Ramdasji was appointed as the fourth Sikh Guru. “God had put himself in the Guru”, said Guru Nanak in the Adi Granth. Outwardly the Guru is a human being, but inwardly the Guru is God, the manifested embodiment of the spiritual essence.